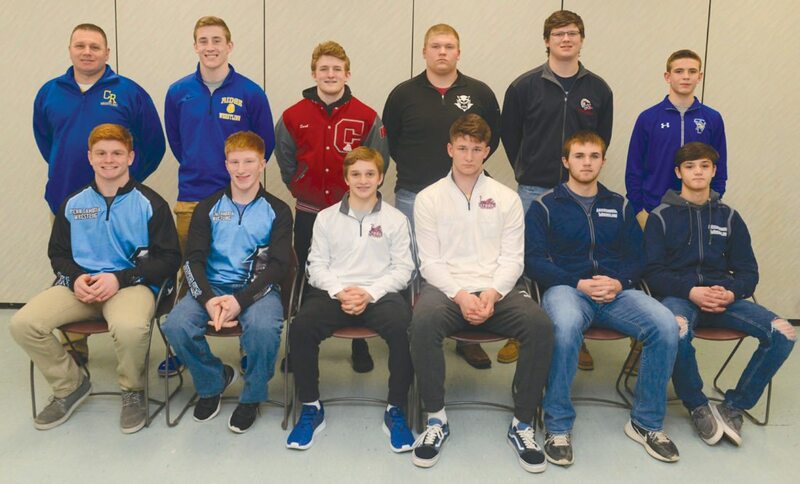 Mirror photo by Gary M. Baranec Members of the 2017-18 Mirror Wrestling All-Star team include (from left): First row—Penn Cambria’s Derek Brown (170 pounds) and Chase Proudfit (132), Altoona’s Matt Sarbo (106) and Parker McClellan (220, Co-Wrestler of the Year), Philipsburg-Osceola’s Brandon Anderson (195) and Chase Chapman (120). Second row—Chestnut Ridge’s Greg Lazor (Coach of the Year) and Justin McCoy (152, Mirror Co-Wrestler of the Year), Central’s Braeden Swab (138), Central Cambria’s Nate Martin (285), Huntingdon’s Landon Fisher (220) and Glendale’s Brock McMillen (113). Absent from photo were Hollidaysburg’s Nathan Swartz (138) and Mason McCready (182), Everett’s Garret Cornell (126) and Macen Akers (145) and Chestnut Ridge’s Jared McGill (160). It was a memorable 2017-18 season for Chestnut Ridge senior Justin McCoy, Altoona senior Parker McClellan and Glendale freshman sensation Brock McMillen. They all made it to the state finals, but they came up one win shy of capturing gold medals. McCoy, a returning state champion, made it to the PIAA Class 2A finals again, but he had to settle for a silver medal this season. McClellan surprised many by making it to the 220-pound Class 3A finals, where he took second. McMillen was also a state Class 2A runner-up, losing to Mount Union’s Josh Boozel in the finals of all three postseason tournaments. Chestnut Ridge coach Greg Lazor counted on McCoy to get wins and bonus points during another great season for the Lions. The runners-up and Lazor are part of the best of the best of the 35th annual Mirror All-Star Team. McCoy (45-2 this season, 167-18 in his career) and McClellan (30-6 this season, 105-34 in his career) have been named the Co-Wrestlers of the Year. Lazor has been named the Mirror Coach of the Year for the fifth time in the last seven years. McClellan raised eyebrows when he moved up to 220 from 195 late in the season, but the move paid off. He won his second District 6 title, finished second at the Northwest Regional for the second time and made a surprising run to the state finals. McCoy, voted the Outstanding Wrestler at the District 5 Tournament, became only the third wrestler in school history to win four District 5 titles, and he’s the first Ridge wrestler to earn four state medals. His 167 wins and 80 pins are Ridge records. McMillen will be one of the favorites to be named the Wrestler of the Year next season. Lazor, who is 187-47 in his career, led the Lions to a 16-3 record, their sixth straight District 5 Duals title and a third-place finish at the PIAA Duals. 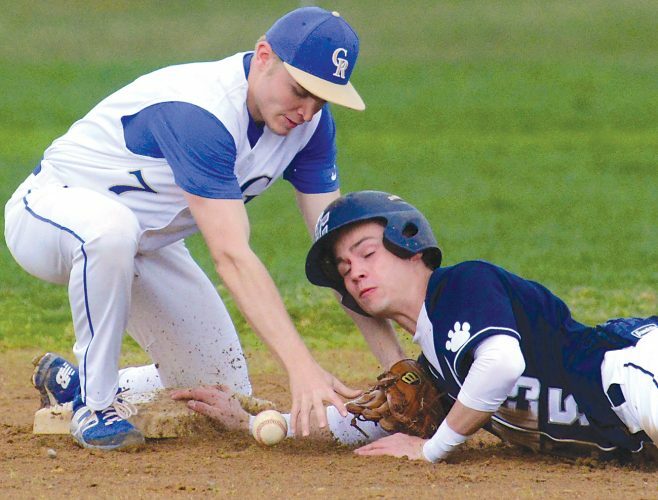 Lazor led Ridge to its seventh straight District 5 title, crowning a school record eight champions and qualifying a program best 13 Southwest Regional qualifiers, its second regional title and a sixth-place finish at the PIAA Championships. More on the Wrestlers of the Year and the Coach of the Year on the following page of the Mirror. The first, second and honorable mention teams follow the order of the Mirror rankings, with some exceptions at deep weights like 138 and 220, where there are two first-teams, respectively. The deepest weight is 126, where there are seven wrestlers on the three teams. 113 pounds: Brock McMillen, Glendale: If it were not for Boozel, McMillen might have gone undefeated and won a state title. The Viking freshman went 41-4, with all of his losses coming to returning state runner-up Boozel, including a 7-3 decision in the state finals, and he recorded 21 pins and six technical falls. A District 6 Class 2A and Southwest Regional runner-up, he became the first Glendale wrestler to reach the state finals since Tom Ross in 1986. 120 pounds: Chase Chapman, Philipsburg-Osceola: The Mountie sophomore won a District 6 Class 3A title after suffering an injury in the tournament as a freshman. He went 26-8 with 11 pins and five major decisions after going 21-14 last season. 126 pounds: Garret Cornell, Everett: In his third trip to the PIAA Class 2A Championships, the Everett junior finally broke through for a medal, placing third with a 5-1 mark. A two-time Mirror first-teamer, Cornell won his second District 5 title and finished third at the Southwest Regional. He went 39-4 with 22 pins, and he’s 102-17 in his career. 132 pounds: Chase Proudfit, Penn Cambria: The Panther junior went 30-16, but he turned it up a notch in the postseason to return to the state tournament for the second time after falling short as a sophomore. He finished third at the District 6 Tournament and sixth at the Southwest Regional after reaching the semifinals. On the first team for the first time, Proudfit is 84-45 in his career. 138 pounds: Nathan Swartz, Hollidaysburg: The Golden Tiger senior finished second at the District 6 Class 3A Tournament, dropping a 9-7 decision to Bald Eagle Area’s eventual state runner-up Seth Koleno. He finished third at the Northwest Regional, and he went 2-2 at Hershey. Swartz went 31-9 with 19 pins and four major decisions, and he was 97-43 in his career. 138 pounds: Braeden Swab, Central: The Scarlet Dragon senior makes his first appearance on the first team after going 33-8 with 15 pins and four technical falls. Swab finished third at the District 6 Class 2A Tournament and the Southwest Regional, and he finished eighth in his first state tournament. He was 108-36 in his career. 145 pounds: Macen Akers, Everett: Akers returned to the Warrior lineup later in the season, and he finished second at the District 5 Tournament. He came up a win shy of reaching the medal round and qualifying for the PIAA Championships, and he finished with a 12-8 mark. 160 pounds: Jared McGill, Chestnut Ridge: What a junior season it was for McGill, who became the first Ridge wrestler to win a title at the prestigious Powerade Tournament. He won his third District 5 title, captured his first Southwest Regional crown and took a 42-0 record into the state tournament. At states, he knocked off Wyalusing state champion Creighton Edsell twice, including pinning him to take third. He was, though, upset by Port Allegheny’s Jacob Kallenborn, 8-7, in the semifinals. It was the third state medal for McGill, who finished 46-1 with 22 pins and seven technical falls. On the first team for the first time, the Army recruit is 122-16 in his career. 170 pounds: Derek Brown, Penn Cambria: The Panther junior makes his first appearance on the first team after going 36-8 with 15 pins. He finished second to Ligonier Valley’s three-time state runner-up Robby Patrick at the District 6 Tournament and the Southwest Regional. Brown, who is 93-33 in his career, placed sixth in his second appearance at the state tournament. 182 pounds: Mason McCready, Hollidaysburg: McCready wasn’t afraid to move up against the toughest competition, moving up to 195 against state runners-up McClellan and State College’s Cole Urbas. The Tiger junior won a District 6 Class 3A title, took third at the Northwest Regional and finished eighth in his first state tournament, becoming the first Hollidaysburg wrestler since Brian Shaw in 2006 to earn a medal. McCready finished 30-9 with 15 pins and five major decisions, and he’s 72-38 in his career. 195 pounds: Brandon Anderson, Philipsburg-Osceola: After an injury-marred junior season, Anderson went 28-9 with nine pins as a senior. He finished second to Urbas at the District 6 Class 3A Tournament and was fourth at the Northwest Regional – a win shy of qualifying for states. 220 pounds: Landon Fisher, Huntingdon: The Bearcat senior returns to the first team after finishing second to Bishop McCort’s eventual state champion Anthony Walters, third at the Southwest Regional and fifth in his second state tournament appearance. Fisher, who wrestled sometimes at 285, went 45-7, setting a school record for wins, with 24 pins. He went 104-44 in his career. 285 pounds: Nate Martin, Central Cambria: A second-teamer last season, Martin makes the first team after finishing second at the District 6 Class 2A Tournament, dropping a 2-1 tiebreaker decision to Bishop McCort’s top-ranked Josiah Jones, and placing fourth at the Southwest Regional. The Red Devil senior went 2-2 at Hershey — coming up a win shy of earning a medal — in his second state tournament appearance. He finished with a 32-10 with 17 pins, and he was 89-34 in three years.